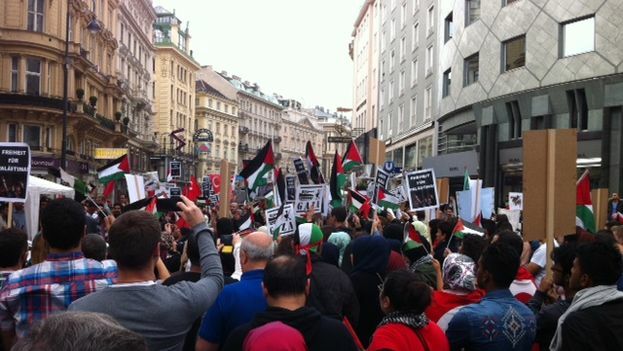 A friend sent me photos of a demonstration in the streets of Vienna in support of the Palestinians. I also received–from all over the world–images with signs of solidarity or rejection of one or the other of the parties implicated in the conflict in Gaza. Many take sides and demonstrate it, be it a tweet, a way of dressing, a shout or a public protest. In Cuba, however, only the official press and institutions may speak in headlines and statements. In the 14 days of the latest bloody confrontation between Israel and Hamas, no spontaneous demonstration on the subject has taken place in our public spaces. Freedom can be simulated, replaced by false statistics of well-being and justice, but someone always puts it to the test. That public protests on national and international issues don’t happen in our territory is evidence of the lack of rights and social autonomy we endure. It is this same gagging of public speech that prevents organizations like those of the LGBT community from protesting the arrival on the island of Vladimir Putin, considered one of the most homophobic presidents on the planet today. It is also a bad sign that today, during the arrival of Xi Jinping, no one is seen outside the airport demanding the release of Chinese dissidents or asking for greater environmental protections in that country. I repeat, freedom can be simulated, but its lack is obvious in a minute, its immense absence. So among my friends–one of whom has prepared his keffiyeh, while the other has a Star of David tattooed on his arm–cannot march through the streets of Havana showing their preferences or outrage. No one is allowed, of their own initiative, to denounce the deaths, the blood, the pain. Thus, we will not see pictures from Havana with the streets filled with people outraged by the events in Gaza.